Appeared in 31 games (four starts) and averaged 3.4 ppg and 3.3 rpg in 10.4 mpg … shot .556 from the field and .714 from the free-throw line … played career-high 29 minutes on 4/13 vs. PHI and recorded career-high 4 assists while tying career-high 2 blocks … tied career-high of 16 points on 6-of-8 from the field in 27 minutes at NOP (4/11) … tallied 16 points on career-high 7-of-7 shooting (with 2-of-2 free throws) and tied career-high 2 blocks on 4/9 vs. CLE … had 8 points, 5 rebounds and 1 block in just 6:39 of action on 3/29 at IND … made first career start on 3/19 vs. UTA … on 3/17 vs. BKN, posted career-high 10 rebounds … grabbed 5 rebounds in 5 minutes on 3/2 at ORL … recalled from Canton Charge on 1/16 … averaged 14.3 points and 5.4 rebounds in 23.3 minutes through four games with the D-League team … returned to the Charge on 1/15 … recalled from Canton on 1/13 to join the team for the 1/14 game at PHI … assigned to Canton Charge of NBA D-League on 12/31 … saw first NBA action on 11/9 at PHI and recorded 1 assist in 1 minute … scored first NBA points (2) on 11/27 at IND. With C.R. Flamengo of the NBB (Novo Basquete Brasil), played in 48 games (nine starts) and averaged 5.6 ppg, 4.9 rpg, 15.4 mpg, .652 from the field and .695 from the line. Appeared in 47 games (seven starts) and posted averages of 5.4 ppg, 3.9 rpg, 13.0 mpg, .551 from the floor and .634 from the free-throw line … posted 7.1 ppg and 5.6 rpg in 14.1 mpg in seven games during the FIBA Americas’ club league … tallied five games with 10+ points. 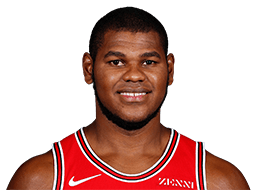 In 26 games (12 starts), averaged 8.8 ppg, 4.6 rpg, 1.04 bpg, .647 from the field and .736 from the line for Minas Tenis Clube of the NBB. Signed as a free agent by Chicago (7/12/15). Full name is Cristiano Silva Felício (cree-STEE-YAHN-oh Fell-EE-see-oh) … attended CCSE Preparatory Academy in Sacramento, Calif., from 2012-13 … competed in the 2011 FIBA U19 World Championship and the 2011 Nike Global Challenge.